A Hernando County mother and her three children said trees collapsed onto the family's car within seconds of pulling into their driveway Friday afternoon. 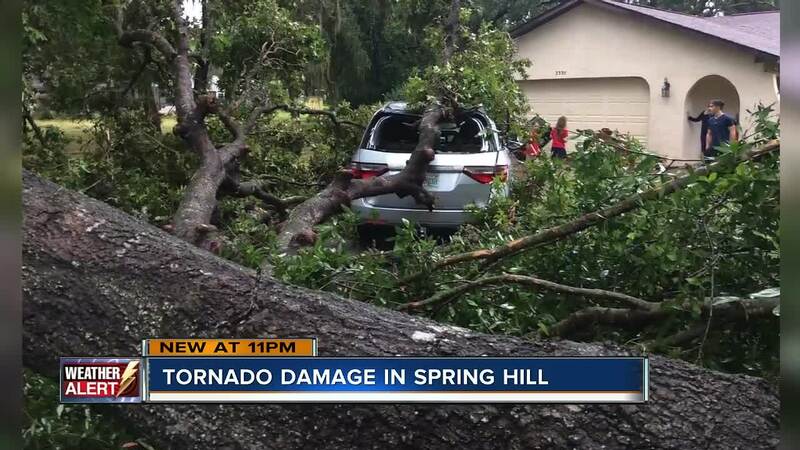 SPRING HILL, Fla. — A Hernando County mother and her three children said trees collapsed onto the family's car within seconds of pulling into their driveway Friday afternoon. "It was just some light wind and rain to craziness," said the mother of three. Strong winds broke the car's back and side windows. The trees missed her twins in the backseat. "It was me and my two 5-year-old's and my 6-year-old and then the tree hit right in the middle of where the two boys sit in the back on top of the car." The Hernando County Sheriff's Office said the most damage was reported on Lorendale Circle and Dunkirk Road in Spring Hill. A driver shared video she took while stopped at a red light. The video shows a tornado sweeping across the road on Landover Blvd. and Elgin Blvd. in Spring Hill. Other homeowners said heavy winds ripped apart their pool cages and roofs. Lisa Leone has significant damage to her home. "When I came here, I couldn't believe it. The house was cracked in half. Trees are gone in the backyard. Every time, I look around there's something else wrong," said Lisa Leone. She said she bought $100 worth of tarps to cover the damage to her roof. County building inspectors assessed the damage on Friday evening. The Hernando County Sheriff's Office had no reports of any injuries.